Got a Group to Serve? 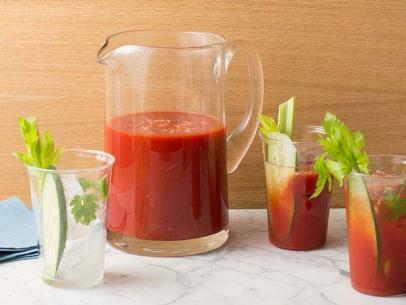 This Bloody Mary Mix is the best I have used at the restaurant and at home. I've tried many others, of course, but hundreds of regular restaurant guests have approved of this "merry" mix (sorry) above all others. It is a favorite restaurant recipe for Bloody Mary's. On Sunday mornings the restaurant sells more Bloody Mary's than most people would believe. They sell them throughout the rest of the day, as well. Sunday mornings are very busy at the restaurant. I believe most viable restaurants are the same. Many years ago, the bartenders and I decided we could give better (and quicker) service if we made "batches" of Bloody Mary's ahead of customer arrivals. This bloody Mary recipe worked perfectly. One day while visiting in Tucson, I asked my husband to join me at 4AM! 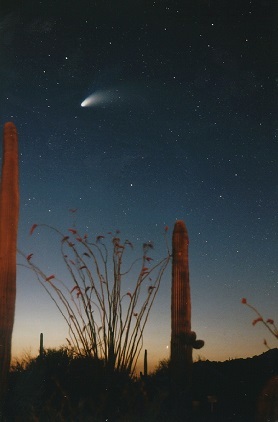 on a beautiful patio over-looking Pusch Ridge to watch for the Hale-Bopp Comet (remember?). I believe that was 1997. Oh, to be young again! Before we went to bed the evening before, I made this restaurant recipe and put it in the refrigerator. I didn't tell him, but was he pleased to be handed a great Bloody Mary at 4 AM! We spotted the comet, watched a while, talked and then went back to bed for a few hours. We both slept well and when we awoke we each had enough mix for one more drink with our breakfast. We still talk about how crazy we were. So here you go! Enjoy your Bloody Mary Mix Recipe. It is a favorite restaurant drink recipe. Fill the glass, garnish, and serve ...and enjoy! Thanks for finding the website and staying awhile. Please add the site to your favorites and visit often. More real restaurant recipes are added regularly. Enjoy your Bloody Mary and the company of those you share it with! Did you know? 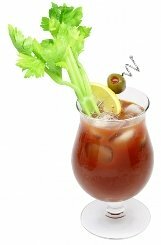 The Bloody Mary is mostly a morning drink because it was originally made to cure hangovers.